The SLF session provided information for someone who is not familiar with SLF, and individuals with some background but would like an update on the latest developments. Just like other invasive species, we need to be alert to our own surroundings and if we see something that we suspect could be SLF or another invasive species, report it using the Great Lakes Early Detection App, contact the Ohio Department of Agriculture (ODA), or your contact in the local OSU Extension Office. The SLF has not been detected in Ohio, but we must remain on alert. This webinar is a great way to quickly get up to speed and know what to look for throughout the entire year. 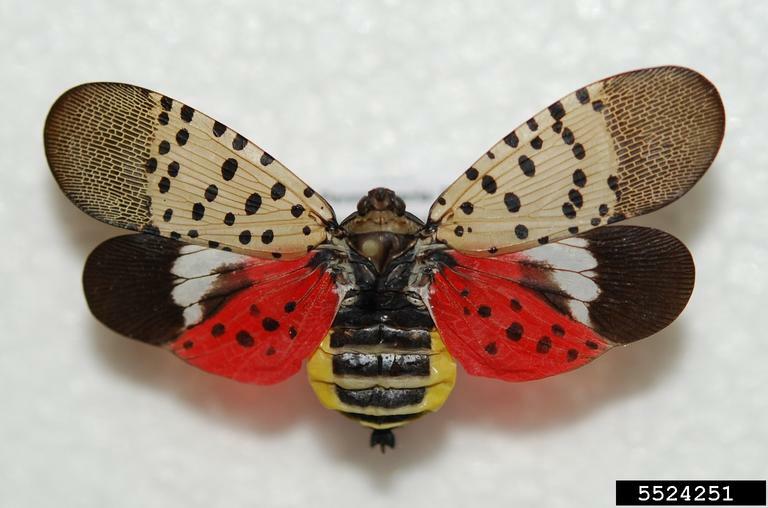 The presenters for the SLF webinar were Heather Leach, Spotted Lanternfly Extension Coordinator and Dr. Julie Urban, Senior Research Associate, both of Penn State University. They were able to share their knowledge and first hand experience on a pest we do not want in Ohio. I found the session to be very useful and filled with practical information. The speakers included the photo below in their presentation. While I was taken back by the number of SLF adults in this photo, I reminded myself to be alert to not only these huge number that anyone would likely notice, but fine tune my diagnostic skills to look for the single specimen, the egg mass at quick glance could look like mud, or the unusually high activity of yellow jackets attracted to the honeydew produced by the SLF this time of the year. You can help fight invasives species by learning more and engaging others about these pests.